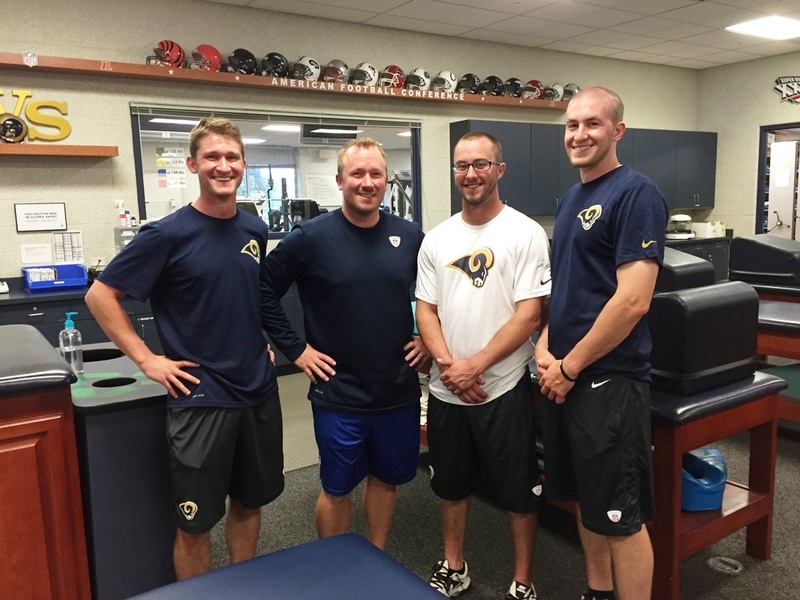 Our time this summer with the St. Louis Rams has been an amazing experience. Even though we’ve only been here for a short time, we have learned so many new things and continue to learn new things every day. Our day at Rams Park starts earlier than most, as it is our responsibility to prepare the athletic training room for the day. This includes getting the therapeutic modality machines set up, ice bags made, preparing the recovery room for HRV (heart rate variability) readings, and placing the GPS units inside the players’ uniforms for practice. From there, we monitor the recovery room during HRV readings, lend a hand with any treatments and rehabilitations that may be happening that day, assist with running the vision board for vision training, then start setting up the field before practice and breaking it down after practice. Afterwards it’s back inside for more treatments and doing just about anything else that may need to be accomplished to help things move as smoothly as possible for both the athletes and athletic training staff. Through times of observation, asking questions, and some hands-on experiences we have gained more expertise in the areas of new treatment protocols, rehabilitation techniques, performance enhancements, and sports-specific progressions, and there is still so much more learn. 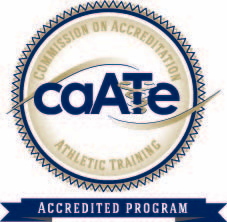 Previous to this clinical experience, each of us worked in the high school and collegiate athletic training setting. Obviously, it is no surprise that the resources that the Rams organization possesses are far greater than that of our prior clinical sites. As you can imagine, it did take us a little bit of time to orient ourselves and become comfortable with the location of their inventory. 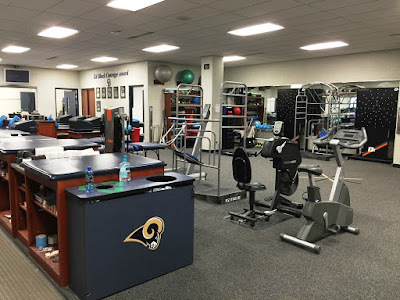 Working with the Rams has also allowed us to use a wide variety of modalities that we may not have had an opportunity to use with another organization. These types of resources may play an important role in our career, as exposure to the best equipment will allow us to become technically savvy with nearly everything we could come across in the future. It is been interesting to witness that although the Rams sports medicine staff does have access to more resources than other settings, the profession that is athletic training is still practiced in the same manner; with the main priority being patient-centered care. The time we have spent in the Rams athletic training room has taught us that although we have access to a multitude of resources (expensive modalities, rehab equipment and training aids); the fundamental aspect to this profession is treating our patients with respect and dignity. In conjunction with that, we have noticed that the other employees at Rams Park have the same attitude. From the coaching staff to the building maintenance crew, each individual gives and receives the same amount of respect to each person that walks in the door. The athletic trainers value our role as health care professionals who can help improve their quality of care rather than only assigning busy work that they don’t want to do, which we gladly do anyway. This type of environment provides a feeling of a community in the workplace which you enjoy coming to your job each day. We cannot give enough praise and thanks to the athletic training staff which consists of the head athletic trainer Reggie Scott ATC, assistant athletic trainers James Lomax ATC, Byron Cunningham PT, ATC, Tyler Williams ATC, and 2015 SLU alum Hilary Stepansky ATC for all of their willingness and patience to teach us new things and explain what they’re doing, even with their busy schedules.